This is a corner of my home, my bathroom to be exact. We have a large bathroom, large and messy usually. We are going to get some new windows as the old ones are falling to bits and a man came to measure today, so I had to clear the area of its usual laundry heap. I have been meaning to photograph this chair for a while, but never know where to do it, as the light in the bathroom is rubbish. If it stops raining later this week I will take it outside so I can do it justice. However, in-situ it sort of sums up our day-to-day life, even though I have cleared most of the stuff, there is still paint lurking underneath (when we painted the bathroom last year we never got round to painting the ceiling - its still waiting), and of course the inevitable pile of electrical leads that exist in each and every room my husband has a hand in (and I know you shouldnt have this sort of thing in the bathroom, but it falls on deaf ears honestly). Anyway, back to the chair, this is another inherited item that came with the house(the previous owner left a great deal of junk), it is a very heavy large dining chair, and I loved the shape of it, although one bit of the backrest had a split in the wood. While I was wondering if I could rescue it, perhaps by wrapping something around to fix it, there was an exhibition of chairs by art students at the then new Ikea in Cardiff. 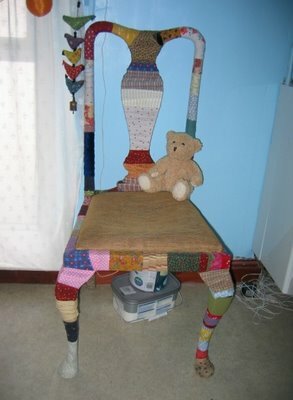 One student had wrapped fabric, ribbons etc around a chair in a similar way to this, and I just loved the idea, so my lovely shaped chair got some new clothes! I fixed the fabric by dipping each piece in pva glue before wrapping it around the woodwork. I still love it every time I look at it. It's beautiful, Hannah! Such a clever idea for recycling an otherwise used up piece of furniture. I bet it would make a cool frame treatment too. Great idea and it looks wonderful too!! Isn't this chair just the best! All of gentlytiptoes house is cool, in fact I'm over her house now eating cake. I'll try too persuade her to post more pictures of inside her house. Go on weirdbunny, make her take more photos of her home. I want to see more. I bet there's lots of clever and beautiful ideas around. Oh! BTW, don't let those leads spread out. Kill them!